LOVING. LIVING. SMALL. turns 1 today! SMALL SPACE INVESTMENT...TRY A DESIGN CLASSIC! I had a fabulous meal this week at Venice hot spot, Gjelina. The decor and food were rustic + simple + amazing. 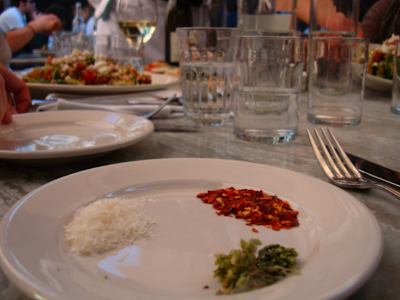 My favorite little detail was the side plate of spices that came with the truffle oil white pizza. i love these little details and look for comprable moments in my home. Small details create a big impact.